ISLAMABAD, Sep 23 (APP): Hurriyet leaders and organizations have praised the stance taken by the Pakistan Prime Minister, Mohammad Nawaz Sharif, during his speech at the United Nations General Assembly (UNGA) in New York. 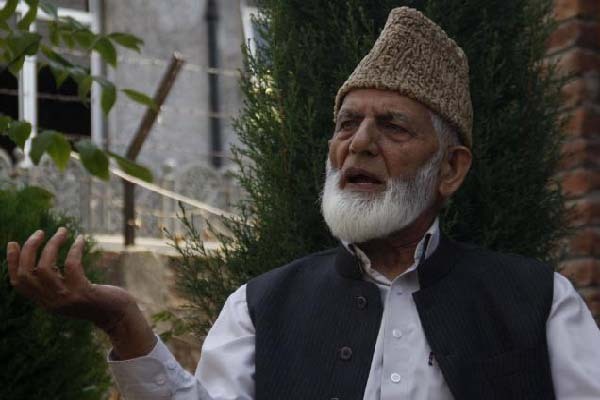 Syed Ali Gilani in a statement issued in Srinagar, lauding the speech said, “Nawaz Sharif courageously highlighted the Kashmir dispute and proved himself a friend and well-wisher of Kashmir,” KMS reported. He said although the UN has not lived up to the expectations of the oppressed and suppressed Kashmiris, for which it came into existence, but reminding World Body and its member countries of the long-pending Kashmir dispute, Nawaz Sharif has once again reiterated Pakistan’s stand that unless the core issue of Kashmir is resolved as per its historical perspective and according to the wishes of Kashmiri people, dance of death and destruction will have no end. The APHC Chairman said that list of crimes committed by the Indian forces was very long and it was lengthening with each passing day. Killings, molestations, ransacking of buildings, arrests, humiliations and harassments are the common and much used tools of world’s largest democracy by which they try to muzzle our just voice, he added. He said that Nawaz Sharif drew the attention of the world community towards the deteriorating human rights situation in occupied Kashmir and exposed the repressive face of India, which claimed be the largest democracy of the world. The Hurriyet forum led by Mirwaiz Umar Farooq hailing the speech of Nawaz Sharif at the UNGA in its statement in Srinagar expressed gratitude to Pakistan and its government for once again pleading the just political cause of the people of Kashmir before the world. It stressed upon the World Body to fulfill its commitments made with the people of Kashmir through its Security Council resolutions, pending implementation for the past 70 years. The forum said that Nawaz Sharif very emphatically highlighted the ongoing unrelenting and unprecedented oppression and violence being perpetuated upon the people of Kashmir by the Indian state and presented a detailed dossier of the grave human rights violations being committed across the territory to the UN Secretary General Ban Ki-moon. The Illegally detained Chairman of the Jammu and Kashmir Liberation Front (JKLF), Muhammad Yasin Malik, in his said that Pakistan was making all efforts to highlight the plight of suppressed Kashmiris. He said that the UN should implement the suggestions presented by Nawaz Sharif and play its role in resolving the long-pending dispute. He appealed to the UN to take strong note of killings and excesses committed by Indian forces in occupied Kashmir and impress upon New Delhi to end suppression of Kashmiris and forcible control over Jammu and Kashmir. He hoped that in future also Pakistan would continue to support the just cause of Kashmiris. APHC leader, Nayeem Ahmad Khan, in his statement in Srinagar hailed the address of Nawaz Sharif in the UNGA. “Political disputes like Kashmir could be resolved by political statesmanship and concrete political measures. Kashmir dispute cannot be resolved by New Delhi’s jingoism, unethical attitude and use of brute force against the freedom-loving Kashmiri people,” he maintained. Dukhtaran-e-Millat Chairperson, Aasiya Andrabi in her statement expressed gratitude to the Prime Minister of Pakistan for his bold and realistic speech on Kashmir at the UNGA session. She said the speech by Nawaz Sharif at the UNGA is a big step towards the success of ongoing resistance movement.